Candace McCowan has more from the victim on what happened. 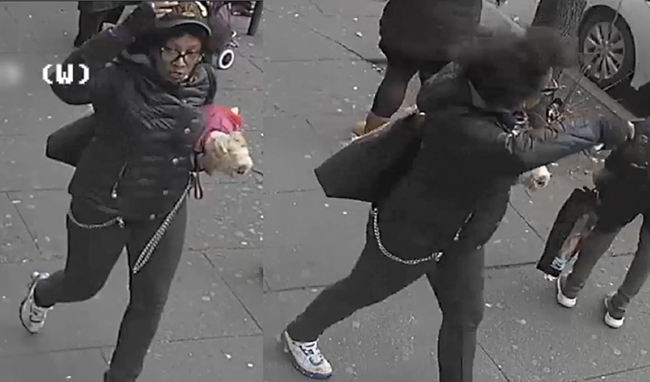 MELROSE, Bronx -- Police said a woman on a bus in New York City slashed two fellow riders after one of them tried to pet her dog. The incident was reported on an MTA bus in the Melrose section of the Bronx around 2:30 p.m. Monday. Authorities said the two women were riding the bus as the suspect was holding a dog. When one woman went to pet the dog -- possibly a service dog -- police say the dog owner apparently got mad and slashed the woman in the face. "She slashed my face because I went to go touch her service dog," the victim said. The 22-year-old victim sustained four slash wounds but is expected to be OK. The victim's friend, a 20-year-old woman, was slashed in the left arm while trying to intervene. Her wounds needed 12 stitches. Surveillance video showed the victim hurrying off the bus and running to Lincoln Hospital, which is right across the street from the bus stop. The NYPD is still searching for the suspect and released a surveillance photo. The victim told police that the suspect fled the scene inside of a green SUV taxi, which drove westbound on East 149 Street. "She had the dog in her hands, and she took the taxi and left," the victim said. Police described the suspect as a black woman with glasses who is 30 to 35 years old and approximately 5'8". She was last seen wearing a dark-colored baseball cap, a black waist-length coat, black pants, black-and-white sneakers. and a black shoulder purse. She was carrying a small white dog. The victim's mother said her daughter is in a great deal of pain with two slashes above her right eye and another long gash on the other side of her face. The victim has two young children. It is not illegal to pet a service dog, but strangers should not pet animals wearing vests: That indicates that they are working. In addition, it's always a good idea to ask first before touching someone's pet.